Pauline E. (Delaney) Timmons 92, a life-long Everett resident passed away peacefully at the Leonard Florence Center for Living in Chelsea on November 2. Pauline was born in Malden on September 26, 1925 one of eight children of the late Leo and Marion (Egan) Delaney. Pauline graduated from Everett High School Class of 1943 and continued her education and graduated from the Whidden Hospital School of Nursing Class of 1946.Pauline was raised and educated in Everett and she married Arthur Timmons on August 26, 1950 and together they continued their life in Everett and raised their family. 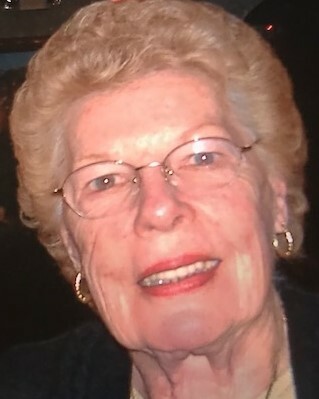 Pauline enjoyed a successful career as a nurse working at the Whidden Memorial Hospital, in the Everett Public Schools and at the Everett Board of Health. Pauline spent her life helping others in their times of need and she even served her country during WW II in the Cadet Nursing Corps. Throughout her life and work, she had made many close and long-lasting friendships. Pauline was concerned only what mattered most, her family and friends; and she served as a source of great inspiration. She was a contributor, a giver and now her gifts will carry on through her children, grandchildren and great-grandchildren. Pauline was the beloved wife of the late Arthur Timmons with whom she shared 62 years of marriage. Pauline was the loving mother of Patricia and her husband Charles Shediac of Boston, Maureen Timmons of Charlestown, Kathleen Timmons and her spouse Thomas Yameen of North Andover, Susan Timmons of Charlestown and Arthur Timmons Jr. of Boston. Pauline was the sister of Irene Ahern, Elizabeth Delaney, Lorraine Thompson, Patricia Delaney, Carol Delaney and the late William Delaney and Leo Delaney. Pauline was the grandmother of Eric Tempesta, Michelle DeCastro and Michael Dello Iacono. Pauline is also survived by 4 great grandchildren. Funeral Services will be on Wednesday from the Murphy OHara Funeral Home 519 Broadway Everett followed by a Funeral Mass in the Immaculate Conception Church at 11am. Visitation will be on Wednesday morning from 9:30 to 10:30 am. Interment Glenwood Cemetery. In lieu of flowers please make donations in Pauline's memory to Rettsyndrome.org 4600 Devitt Drive Cincinnati, OH 45246.